First picture: Vauxhall Ampera | What Car? GM has released a first glimpse of the petrol-electric Vauxhall Ampera, due to go on sale in 2011. 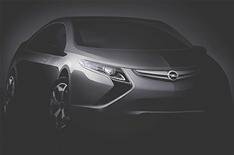 The hybrid Ampera is Vauxhall's version of the Chevrolet Volt, and will make its public debut at the Geneva motor show in March. The car combines an electric motor and a petrol engine, but the front wheels are powered solely by the battery; the petrol engine is used only to power a generator, which creates the electricity to drive the wheels. Using the battery alone, the Ampera has a 40-mile range, but this extends to 300 miles if the petrol motor is used to produce additional charge. The Ampera might eventually be put together in the UK at the Ellesmere Port factory, alongside the new Astra, but GM sources admitted that the first cars will be built in the same US plant as the Volt.